"Ancestral Timurid Group." Digital image. Freer Sackler Galleries, Smithsonian Institution. Accessed August 21, 2010. http://www.asia.si.edu/collections/zoomObject.cfm?ObjectId=3811. Anonymous. Golden Temple, Amritsar 486. 1860. British Library, London. Anonymous. The Battle of Panipat 13 January 1761. 1770. British Library, London. Anonymous. View of Lahore. 1825. British Library, London. Atkinson, James. Kandahar (Afghanistan); View Taken from the Camp of the 4th Brigade about One and a Half Miles South of Kandahar. 1839. British Library, London. Blunt, James Tillyer. F.21 'Panniput 1792. 54 Miles North of Delhi in Bengal.' Landscape with City in the Background. 1792. British Library, London. Bust Portrait in an Oval of the Bhao, Sadhashir Rao, a Maratha General, Killed by Ahmad Shah. 1761. British Museum, London. Carrick, Robert C. City of Kandahar, Its Principal Bazaar and Citadel, Taken from the Nakkara Khauna. 1848. British Library, London. Carrick, Robert C. Mosque of Goolaum Hoosein Huzrut-Jee, a Great Prophet of the Afghauns. 1848. Courtesy of the British Library, London. City of Lahore. 19th C. British Library, London. Guru Gobind Singh. 1800. British Library, London. An Important and Rare Contemporary Portrait of Nadir Shah. 1740s. Private Collection. KES-261-H-172. Khalilullah Enayat Seraj Collection, Williams Afghan Media Project, Williams College, Williamstown, MA. Ram, Sita. Three Sikh Sirdars on Horseback. 1815. British Library, London. Rattray, Lieutenant James. Dourraunnee Chieftains in Full Armour. 1847. Courtesy of the British Library Board, London. Rattray, Lieutenant James. Temple of 'Ahmed Shauh', King of Afghanistan. 1848. Courtesy of the British Library Board, London. Rattray, Lieutenant James. Town and Citadel of Ghuznee. 1848. Courtesy of the British Library Board, London. Shams, A. Ahmad Shah Durrani. In Wikipedia Commons. Accessed August 29, 2010. http://commons.wikimedia.org/wiki/File:Ahmad-Shah-Durani.jpeg. I think the Afghans have always been aware of themselves as a great people in a small nation. Today, Afghanistan looks like this. But this is a country with a long cultural memory. And in that memory, Afghanistan looks more like this. And that’s because of one man: Ahmad Shah Durrani. When the Persian emperor Nadir Shah expanded east and took Kandahar, Ahmad Shah Durrani was a charismatic young man. He joined the invading army, traveled with its campaigns into India, and quickly rose to become one of Nadir Shah’s favorite commanders. When Nadir was assassinated in 1747, Ahmad Shah returned to Kandahar and declared the region independent from the Persians. He rallied the Pashtun tribes in the area and convinced them to join together in fighting outside powers instead of fighting each other. With new, massive armies, he captured Ghazni, then Kabul, then parts of Iran. As Ahmad Shah’s power was rising, the Mughal’s power in India was declining. To save themselves from an attack, the Mughals ceded land to Ahmad Shah. While the Mughals in India were weakening, other powers were starting to rise. The Marathas and the Sikhs were each making important gains, and the power struggle for northern India had begun. 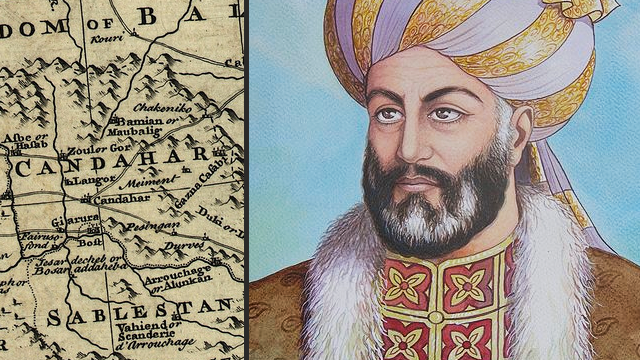 To hold onto his lands, Ahmad Shah Durrani had to do two things. First, he engaged the Marathas in the famous Battle of Panipat in 1761 – a battle that saw 100,000 Afghans fight 100,000 Marathas. Ahmad Shah’s armies won, decisively, and returned home, victorious, to Kandahar. But the sweetness of victory would not last long. This time, the Sikhs were rising, taking the Punjab out from under the Afghans. So in this second attempt to hold onto his lands, Ahmad Shah crossed the Khyber Pass once again the following year. If he had exercised benevolence in previous campaigns, as some historians suggest, this time he unleashed nothing but wrath. He sacked the city of Lahore and killed thousands of Sikhs. In the holy city of Amritsar, he destroyed the Golden Temple and filled its pool with cow’s blood. Ahmad Shah’s empire was facing more and more challenges. The Sikhs continued to rise up, and in the north, other rebellions were also breaking out. The vast empire was beginning to weaken. After his death in 1772, it would disintegrate quickly. Despite its brevity, Ahmad Shah Durrani’s reign was one of the most important in Afghanistan’s history. Finally the region wasn’t the edge of somebody else’s larger empire. Now, it was its own empire, and its people were united under their own common identity. This was a dramatic change, and one that would remain significant into the 21st century. Now, the concept of Afghanistan—of an Afghan homeland—was beginning to emerge. The concept of homeland or watan is an important one in Afghanistan. One of the important ideological developments was to gain or transfer identification of homeland with tribe, tribal territory, to homeland with the nation state. And I think that there is a strong identification among Afghans, and not just Pashtuns, but all Afghans throughout the country, with Afghanistan as a single political entity, and with the idea of Afghanistan as their homeland. Afghanistan, as a concept, had been born. Modern Afghanistan starts to take shape.